I always go for comfort over color and style when I shop for shoes because I can always play around wih the color myself later. 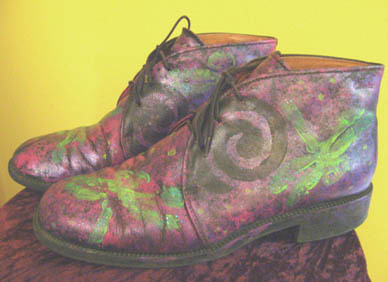 These leather Stonefly boots started out brown, were sponged with black and pink then had the spiral and dragonfly motifs pressed on with inexpensive foam stamps from a craft store. I start by stripping the polish finish off. Here are few of the types of acrylic paints I use next. I spread some paint out on a china plate then capture some on a damp natural sponge. A broken imperfect finish rather than a solid finish is easier to achieve and it seems to just last for ages. I have had some of these shoes for many years and they still look great. 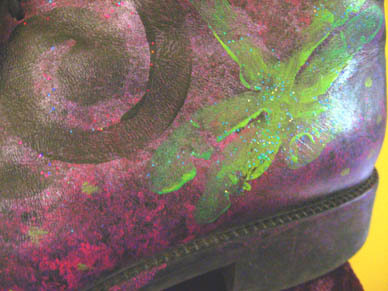 An acrylic craft paint with a glitter effect was used on the dragonfly stamp.These are the only boots that I have ever finished off with an acrylic medium finish for extra shine and protection. I suppose the medium may be a good idea for leather but I have never gone back and touched up any shoes. 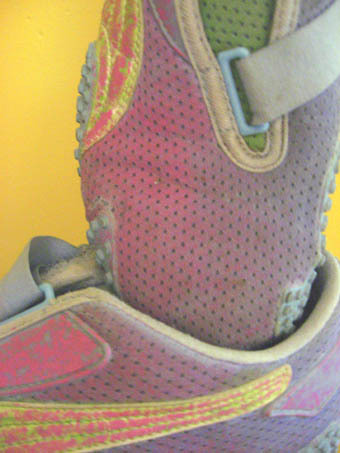 That’s where the broken finish wins out every time over a solid one, in wear and tear. 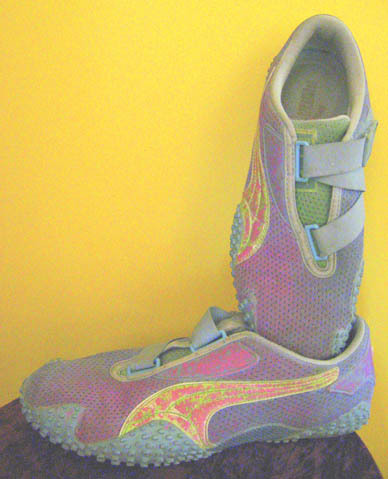 Hand painted Nike running shoes. These started out a pretty pale blue all over. The fabric mesh finish instead of leather made these a perfect canvas for a more fluid watery paint approach and I allowed one color to bleed into another for a lovely washy look. These comfortable and pretty suede shoes started out a nice solid orange. 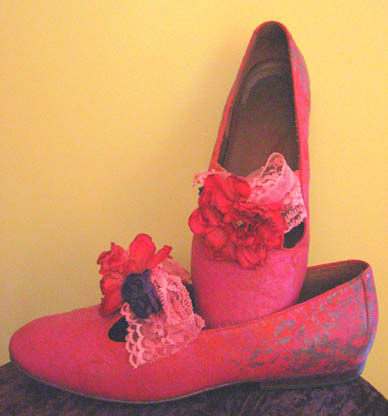 I sponged on pink around the toe and lilac and mauve around the heel then hot glued on the lace bows and silk flowers.